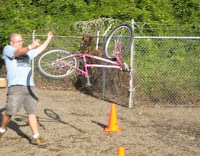 You gotta hand it to Christian Ettinger for taking a chance on BikeToBeerFest. Closing both parking lots at Hopworks Saturday was a bold move, and one that could have blown up in his face. But attendance was good when I was there for a couple of hours in the afternoon, so I suspect that it wasn't a money loser. It was a really good time, and I hope it becomes an annual tradition. By the way, note the spelling -- it's not "Biketoberfest", which was trademarked by a motorcycle event in Florida -- but "bike-to-beer-fest". Nice. The back parking lot and dead-end street were organized really well for the fest. A couple tents with picnic tables were set up on the east side of the lot, between a snack bar and the music stage. In front of the stage was a dance/bike-trick area, and a little more space in front of the tents where a lot of people sat or stood to take in the acts. After some old guys on BMX bikes showed their stuff, local one-man-band Boy Eats Drum Machine put on an impressive show, followed by bike-scene darlings the Sprockettes. I bailed out pretty soon after that, but there was plenty more entertainment as the evening went on, ending up with the March Fourth Marching Band. Booths for a few local bicycle frame-builders were set up along the west side of the parking lot, as was the now famous Hopworksfiets pictured at the top. 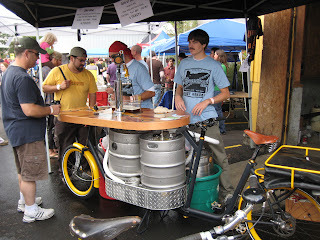 The kegs on the beer bike were dispensing two wonderful beers: a pale ale called Bike Beer, brewed for the occasion, with a dose of fresh hops; and the Ace of Spades , a flavor-packed double IPA. There was plenty of space for milling around between the east and west sides of the festival -- not at all like the fire-hazard conditions at last year's Fresh Hop Festival. Sounds like a lot of action, but wait! There's more! The back forty of Hopworks' long lot had its own share of attractions. A good supply of porta-potties, a row of beer taps with shorter lines than in the front area, a washer-toss area, and best of all, the playing field for a fabulous new sport: Huffy throwing. It's harder than it sounds -- sorry Steve, looks like you gave up a couple of yards by not getting all the way up to the line -- but some people either had a knack for it, or had practiced beforehand. The furthest throw I saw was probably about 15 yards with a good bounce -- very impressive. BikeToBeerFest was definitely not your everyday beer festival -- only one brewery, pints instead of samples, no cars allowed. That's a good thing, something new and fun for the whole family. Congratulations to the whole Hopworks crew for pulling it off. Dang. I miss this aspect of Oregon. Great event, I thought I'd missed out on the Bourbon DOA but they were pouring that there as well. It's awesome that Christian and the HUB crew put on these great community events. Keep em coming!